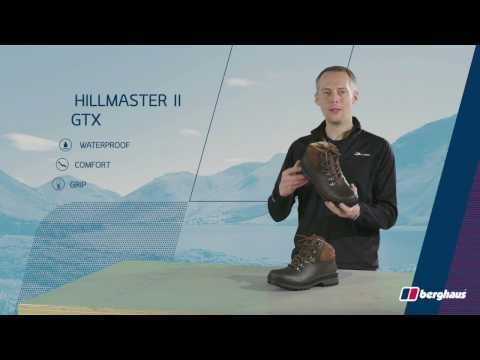 When the Hillmaster GTX made its debut in 1994 it quickly became Britain’s best-selling walking boot. And the latest award-winning version is loaded with innovations that keep it one step ahead of the competition. Memory foam in the collar and tongue give you a truly tailored fit and maximum comfort. Meanwhile, tough but supple leather adds strength while resisting abrasions – and makes this one of the best looking hikers on the hill. A breathable GORE-TEX® lining keeps your feet dry while cushioned, and supportive footbeds combine with an anti-clogging outsole and shock-absorbing midsole to get the best out of your energy on all kinds of trails. WATERPROOF GUARANTEE Thanks to a breathable GORE-TEX® performance comfort membrane, even the wettest weather can’t touch your feet, while sweat makes a clean getaway. TAILORED TO YOU Improved tongue and collar pattern with memory foam adapts to your feet and ankles for a truly bespoke fit. SURE-FOOTED Our VIBRAM® rubber outer sole design gives outstanding grip even on wet rocks and shrugs off sticky mud.